Hasagawa’s Hawker Hurricane Mk.I in 1/48th scale is an excellent replica of the fighter used by Flying Officer Witold Urbanowicz in No. 303 Squadron. The cockpit is constructed from a tubular framework that should be painted RAF interior green, FS-34226. The instrument panel should be flat black with a dry-brushing of light gray to bring out the dials. Use a drop of glaze to simulate the glass covers on the instruments. The rest of the cockpit should be picked out to highlight electrical boxes, levers and knobs. For added realism, I used Cutting Edge Modelworks’ “RAF Sutton Harness” (CEC-48337) seat belts. This kit is the basis of several Hurricane versions, so you’ll choose from different forward and aft portions of the fuselage. Be sure that these are squarely fitted before cementing the cockpit into place and closing the fuselage halves. Glue the wheel wells and radiator parts into the lower portion of the wing and set it aside to dry. Align and glue the top portions of the wing to the fuselage before attaching the bottom wing assembly. The wings have several cutouts for the various Hurricane versions. Make sure you use the eight Browning .303 machine gun inserts used on the Mk.I. The kit also provides a de Havilland spinner, so be sure to use the rounded Rotol version. Paint the prop blades flat black and the Rotol spinner and backing plate gloss black. Hurricane Mk.Is were camouflaged with Sky, type S, undersides (FS-34424) and the topsides in a pattern of dark earth (FS-30118) and RAF dark green (FS-34079). 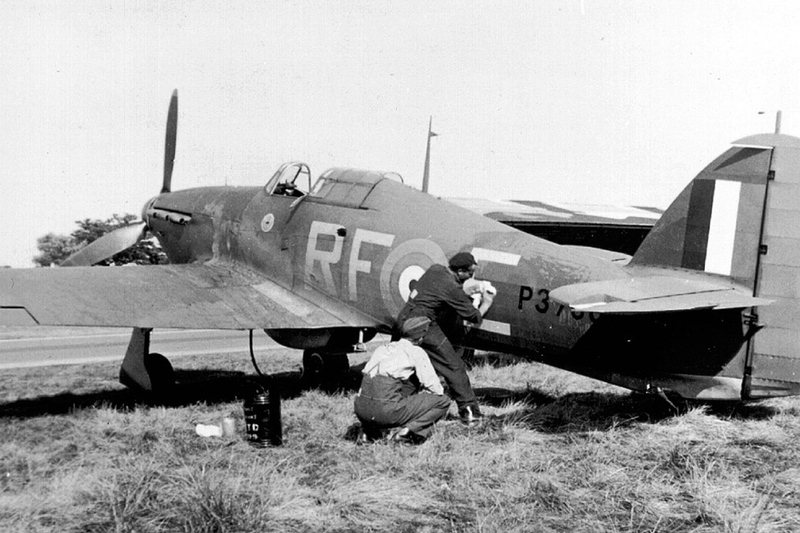 Urbanowicz’s aircraft was probably painted in the British “B scheme” camouflage pattern. This pattern and all of the markings are included on the Sky Models decal sheet “Hawker Hurricane Pt. 1,” 48-051. Mask and spray the wheel wells RAF interior green and the areas around the gun muzzles insignia red (duplicating fabric coverings used to keep dirt out of the gun barrels). To give your plane a more realistic stance, use a True Details Hawker Hurricane resin wheel set, 48-027. After painting the tires Gunze Sangyo “tire black,” dry-brush them with a little light brown to simulate mud. The windscreen and canopy in the kit is molded in the closed position and hides all the cockpit detail. Squadron Products produces a vacuformed canopy that can be easily cut apart so the canopy can be displayed open. I used E-Z Masks #57 pre-cut vinyl cutouts to cover the clear panels during painting. Remove the masks, attach the clear parts with white glue, and your model is complete.